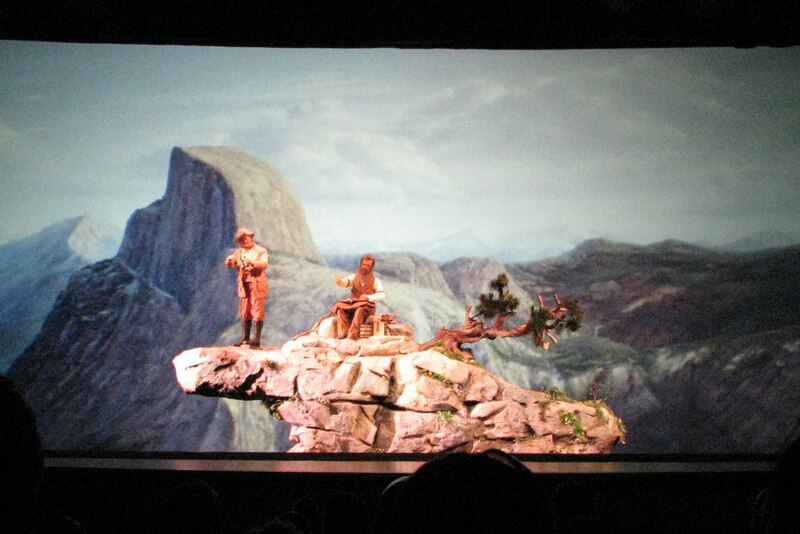 The American Adventure at Epcot may be the Disney Imagineers' most successful effort in combining storytelling and advanced technology to create a fascinating show for their Disney World guests. There are many design elements that are working together to make this a tremendous attraction. Starting with the building itself, this colonial style manor used English Georgian architecture. By utilizing architecture that draws upon America's Colonial times, it automatically draws the guests into one of the most definitive periods of America's history. Once inside the building guests are often greeted in the rotunda by the Voices of Liberty, an a cappella musical group that sings well known American patriotic and folk songs. The acoustical properties of the dome in the rotunda are such that they enhance the clarity of their voices. They are extremely talented, and it is amazing that they are just a small part of The American Adventure experience. If you have time to explore the pre-show area of the building there is much to see around the perimeter of the room. It engages the guests to start thinking about the history of America. As you proceed from the Rotunda to the staging area to enter the theater, you pass through a large hallway with a large number of flags that flew over parts of American during its formative years. Some of these flags were State Flags while others were used to represent the country as a whole. This again prepares the guests for the story that is about to be told. Audio-Animatronic versions of Ben Franklin and Samuel Clemens are the hosts and guide the telling of the story. 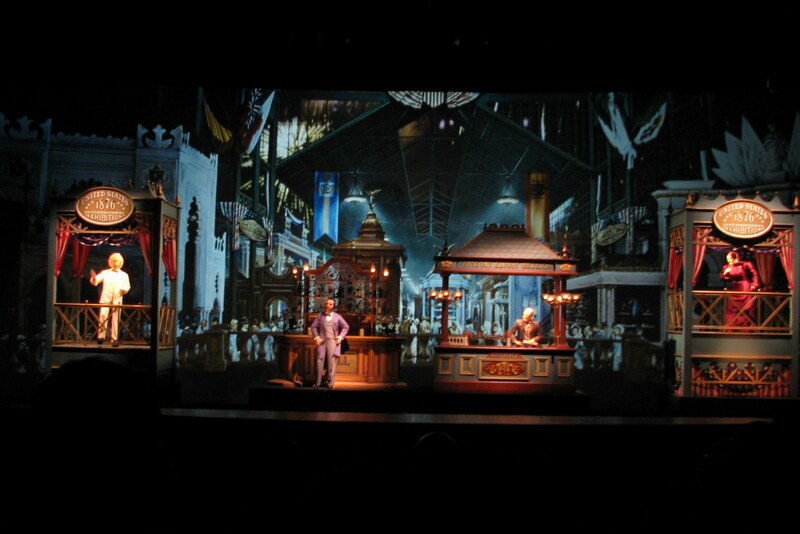 The Imagineers used the fact that they lived approximately 100 years apart to tie the elements of the story together. It presents America as an evolving nation that continually makes strides and overcomes the obstacles presented to it. 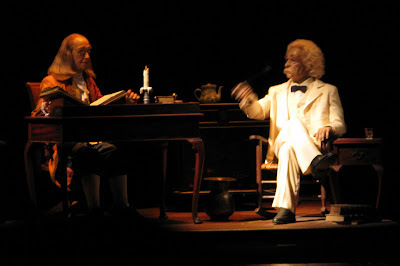 This scene with Thomas Jefferson and Ben Franklin was a landmark for WDI Audio-Animatronics design as Ben Franklin actually walks up steps and then walks across the room to join Thomas Jefferson. This took a monumental engineering feat to successfully complete this effect. Much of the show is presented from the point of view of the common man. This scene shows a Civil War era family that was divided by the war with one son fighting for the North and one fighting for the South. In other scenes you will see the struggle of the Revolutionary War from the point of view from two freezing soldiers, hear a discussion at a small town gas station about life during the Great Depression, and a Rosie the Riveter World War II scene where two women are working to keep America’s Naval Fleet operational. Throughout the show you see examples of the power of the American People to persevere despite the challenges put before them. America’s recovery during the Industrial Revolution and celebration of its Centennial is presented with Samuel Clemens, Alexander Graham Bell, Andrew Carnegie, and Susan B. Anthony. Naturalist John Muir and President Theodore Roosevelt are shown here with Muir making a plea for Roosevelt to preserve the natural beauty of America for generations to come by creating more National Parks. 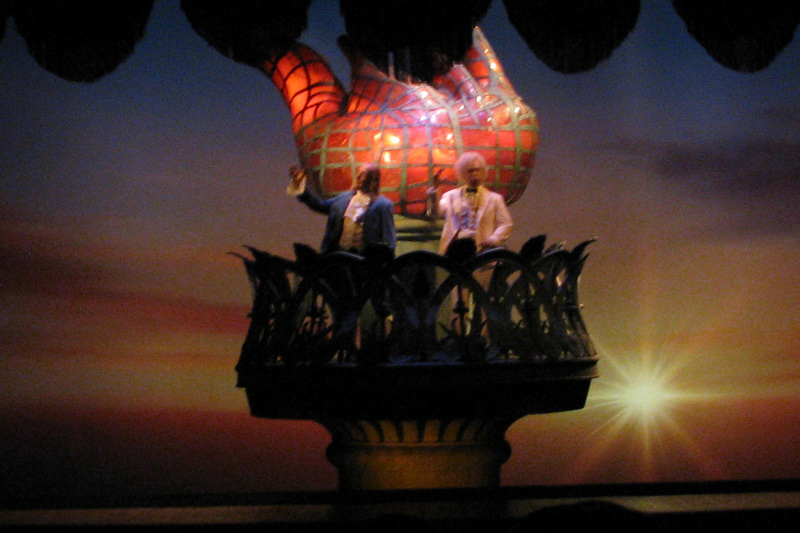 At the conclusion Ben Franklin and Samuel Clemens come together atop the Statue of Liberty to reflect upon where America has been and where it is going. 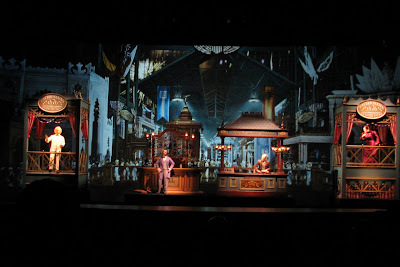 An unbelievable amount of technology went into creating this masterful show. In addition to the audio-animatronic figures that you see, there is a 175 ton, 65-foot by 35-foot scene changer that moves all of the show sets into place before they are elevated into view by telescoping hydraulic lifts. It takes a network of over two dozen computers to control all of the action that takes place during this show. The many audio-animatronic figures used throughout the show have movements and a sense of realism not seen elsewhere. Next time you see the show pay close attention to George Washington's horse, it is hard to tell it is not real. If you watch closely you will also see that any action that takes place in a time that predates the invention of the camera is only shown in artwork or scenes using audio-animatronics, but not in staged photography or film. This was done to give it a higher sense of integrity and consistency with WDI (Walt Disney Imagineering) Philiosophy. 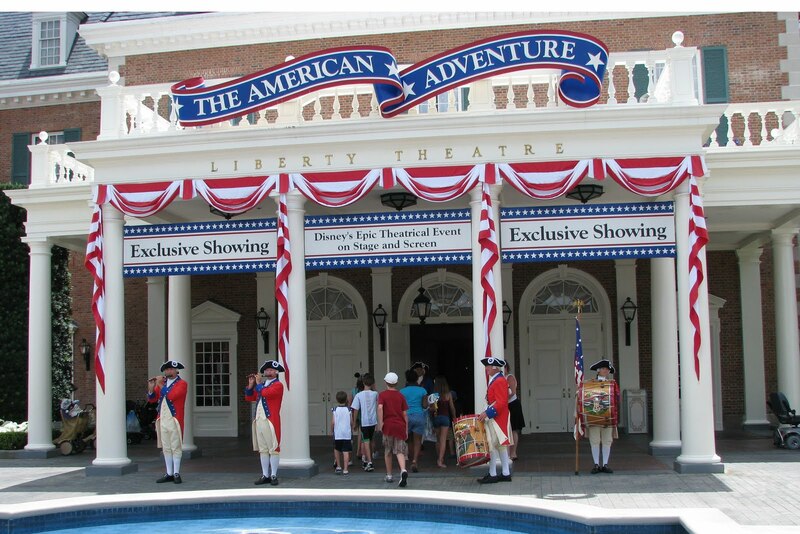 Any trip to Epcot is not complete without seeing The American Adventure. There is so much to see and take in, that it takes many viewings to capture the multitude of details. The more times you see the show, the more you notice and appreciate. 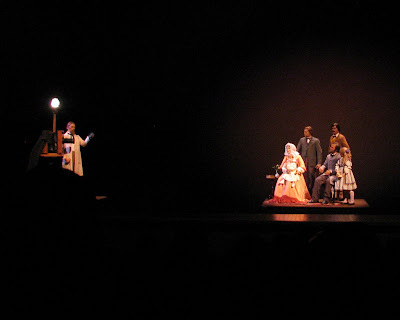 See The American Adventure for the great storytelling, or see it for the impressive technology, but make sure you see The American Adventure. 1 comments to "Disney World Presents: The American Adventure At Epcot"
Don't miss the Voices of Liberty. They are the top singing group at Disney World. It really adds to the storytelling and the adventure of the attraction.